A few weeks ago I offered a Curvy Keepsake and Berry Basket class featuring the Curvy Keepsake Thinlits die and the Berry Basket die. We made the cutest projects! Today I'd like to share one of them with you. 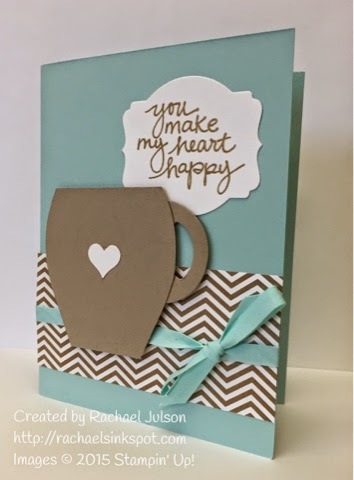 This card used the Curvy Keepsake die to make the adorable coffee cup. Want to make it for yourself? Simply use the die to cut out the box, and then use your Stampin' Trimmer or paper snips to cut along the lines shown in the diagram below (I borrowed this diagram from Vicky Hayes' blog, which you can see here). Super easy, huh? I'd love for you to give it a try!